In those days, the princes said to the king: “Jeremiah ought to be put to death; he is demoralizing the soldiers who are left in this city, and all the people, by speaking such things to them; he is not interested in the welfare of our people, but in their ruin.” King Zedekiah answered: “He is in your power”; for the king could do nothing with them. And so they took Jeremiah and threw him into the cistern of Prince Malchiah, which was in the quarters of the guard, letting him down with ropes. There was no water in the cistern, only mud, and Jeremiah sank into the mud. Ebed-melech, a court official, went there from the palace and said to him: “My lord king, these men have been at fault in all they have done to the prophet Jeremiah, casting him into the cistern. He will die of famine on the spot, for there is no more food in the city.” Then the king ordered Ebed-melech the Cushite to take three men along with him, and draw the prophet Jeremiah out of the cistern before he should die. R. (14b) Lord, come to my aid! R. Lord, come to my aid! The LORD heard my cry. he made firm my steps. yet the LORD thinks of me. O my God, hold not back! Brothers and sisters: Since we are surrounded by so great a cloud of witnesses, let us rid ourselves of every burden and sin that clings to us and persevere in running the race that lies before us while keeping our eyes fixed on Jesus, the leader and perfecter of faith. For the sake of the joy that lay before him he endured the cross, despising its shame, and has taken his seat at the right of the throne of God. Consider how he endured such opposition from sinners, in order that you may not grow weary and lose heart. In your struggle against sin you have not yet resisted to the point of shedding blood. Before I begin this reflection, allow me to show a very short video clip from the movie 'Brother Sun, Sister Moon'. You may know the movie already about the life of Giovanni di Pietro de Bernardoni. Later I will tell you who Mr. Bernardoni is. In the scene, his father, who is a wealthy businessman, brought the young Giovanni to the bishop, because Giovanni was causing trouble, especially for the family. He gave away everything, and the father was so upset, that is why he brought Giovanni to the plaza before the bishop. So that is the context of the short video clip that I will show to you about Giovanni di Pietro de Bernardoni. Let us watch this. The story is about the conversion story of St. Francis of Assissi - whose name was Giovanni di Pietro de Bernardoni. He gave away everything to the dismay of his father. Towards the end, as you heard, he was looking for happiness. He was looking for his soul. And in the end, he says, "I am born again." He is born again in Christ. Now, we understand what Jesus said in the Gospel. If I ask you who Jesus is, we will have different titles of Jesus. We call him compassionate Lord, merciful Judge, Sacred Heart, Good Shepherd, meek and humble of heart. But our Gospel today is different. Our Gospel shows a Jesus who challenges, a Jesus who brings conflict even in families, a Jesus who sets the world on fire, just as he did to St. Francis and to many other followers who faithfully took to heart His will. Today, brothers and sisters, that is the grace we pray, that we may truly follow the Lord. That we may have that fire, the fire that Jesus is talking about. Is that fire in our hearts? Every time that we look at the Sacred Heart of Jesus, we will see the heart that is on fire. St. Francis, and so many other saints, even the unknown saints - their hearts were also on fire. To follow Jesus faithfully is to become a contradiction to the world. It is to have another standard that other people are uncomfortable with. The Gospel tells us to risk power, prestige, and even acceptance, if only to advance the ways of Jesus. Sometimes we take it that to follow Jesus is to have an electronic blanket where we could be warm and cozy. That is why some people do not like to join the mass. They prefer the more lively gatherings where they can feel so warm and cozy. At times, we are given, not a blanket to warm our hearts. At times, we see a cross that challenges us, a standard that sometimes we are not comfortable with. A way that is not taken by so many people. But that is the Gospel of Jesus. That is the way of Christ. Yes, we hear Jesus telling us, "Come to Me, all you who are tired and weary, and I will refresh you." But at the same time, Jesus is also telling us to love our enemies, to pray for those who persecute us. "If you want to follow Me, take up your cross and die to yourself." That is Jesus on fire. That is Jesus who will sometimes bring us to conflict. If you were paying close attention to the film, you might have heard a comment of the people on Giovanni - "You're crazy." He may have looked crazy after all. In the scene, Giovanni stripped himself off, and that was true. He got rid of everything, so that he could be free for Christ. Crazy. Not a few times have I heard people say that following Jesus - following the Church - is foolish, impractical, if not abnormal. How many times have we heard that to follow the Gospel is abnormal? To be with the Church is foolish, because it is out of date, hindi na uso, laos na. Ayaw sumabay sa uso. Matigas ang ulo ng Simbahan. Old-fashioned na ang maging Kristiyano. Sometimes, to follow the Lord is like driving counterflow along EDSA at rush hour. It's difficult, it is challenging. But one writer said that 'the risks of life are many, and safety is among them'. Yes, the risk of safety is what most of us, at times, take. Today, the Gospel asks us to risk, to put out into deep waters, to be on fire with the fire of Jesus. To follow Jesus will precisely displace us, will make us abnormal in the eyes of the world. But then St. Paul tells us, 'We may be fools for Christ, we may be crazy in this world, but that is the wisdom of God - the wisdom that surpasses understanding.' As what Jeremiah is telling us in the First Reading, he was persecuted, he was not accepted, because he embraced the ways of God. Today, brothers and sisters, we pray for that grace. We are afraid that we will be rejected if we run counterflow. But then, that is the only way to the happiness that our soul is thirsting for. Mahirap lumaban sa uso. Pag sinasabi ng lahat sa opisina, 'huwag ka nang magsalita, huwag ka nang umamin, makisama ka na lang', minsan mahirap lumaban. In the family, just to tolerate, even if someone has done wrong, pagtatakpan natin, kasi kapamilya natin, kadugo natin, kaibigan natin, kasama natin. But today, we are reminded, ang pinaka-kasama natin, ang pinaka-pamilya natin, ay ang Diyos. God takes precedence over anything else. That is what it means to be on fire. Baptism into Christian life is meant to be a displacement in this world. But it is precisely to call us to the will of God. As we continue with this mass, let us ask ourselves. Andiyan pa ba ang apoy sa puso natin? Marami pong nagagawa ang apoy. At isa sa mga nagagawa ng apoy ay niluluto niya ang isang bagay. Mga kapatid, maraming bagay sa buhay natin ang parang hilaw. Ayaw lang natin aminin. Hilaw ang kasiyahan, hilaw ang kapayapaan, hilaw ang pagkakaisa, hilaw ang lakas, dahil kulang pa 'yong apoy. Today, before the Lord, we ask ourselves. Are we really happy? Do we really know what we are looking for? Is there really that deep conviction that will bring us real fulfillment? Or are we only driven by pride, by anger, by selfish motives, by the ways of this world? Sometimes we are silent, because we are afraid. Silent, because we might be rejected. Silent, because that fire has yet to be set in our hearts. As we continue with this mass, we pray. Lord, set us on fire. 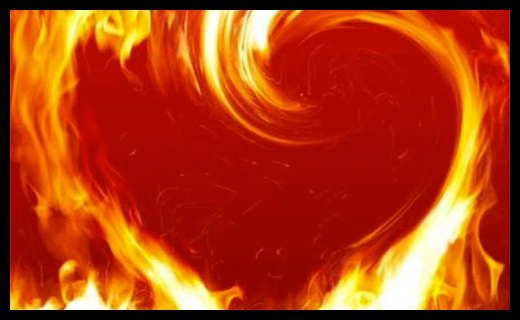 Not the fire of this world, but the fire that comes from Your heart. A fire that will give us real peace, real fulfillment, real happiness. Banish away our fears so that the choices we make will be in accordance with Your will. Amen.